The Executive Committee of the Kerala High Court Advocates Association (KHCAA) has rejected the request made by Advocate General K.P. 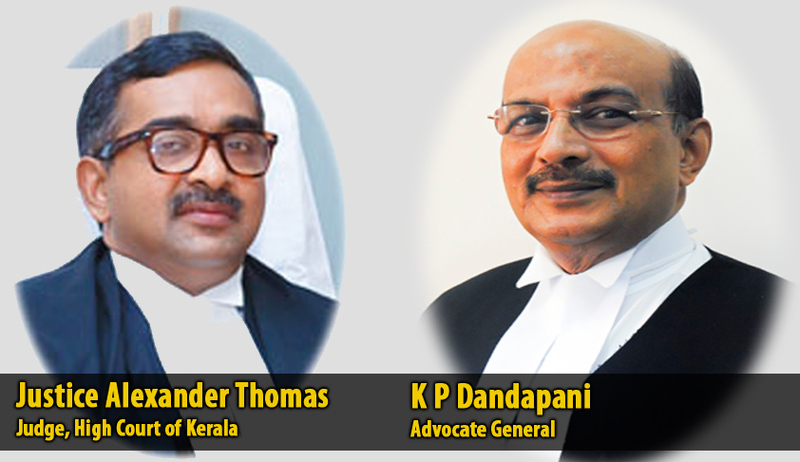 Dandapani not to permit the moving of a resolution at the instance of a section of High Court lawyers expressing concerns at the move of Advocate General KP Dandapani and his family members “in attempting to persuade and pressurize the Hon`ble Chief Justice of Kerala to shift the bold and independent judge Sri. Alexander Thomas to some other jurisdiction”. The proposed resolution was signed by 75 lawyers on Tuesday, thereby meeting the mandatory requirement of 51 votes in support of a resolution for it to be put to vote in a Special General Body of Kerala High Court Advocates Association (KHCAA). This requirement is stipulated in Clause 25 of the Rules and Regulations of Kerala High Court Advocates Association, 1971. Close on the heels of the notice being submitted, Advocate General KP Dandapani had addressed a letter yesterday (on 04.08.2015) to the President of the KHCAA stating that the proposed resolution is baseless as there hasn’t been any attempt on his part or that of his family members to change the jurisdiction of the judge. Demanding that the resolution must be “nipped at the bud itself”, the AG claimed that the resolution amounts to criminal contempt of court. The Executive Committee of the KHCAA met today and unanimously decided to reject the Advocate General’s request to the President to prevent the passing of the resolution. The Executive Committee of the KHCAA said that the Advocate General has no say as to what should be done by the President of the Association and (sic) for that matter by the General body of the Association. “What Justice Alexander said at the High Court is for government’s own good. He had observed that Government Prosecutors had failed to keep up with expectations, and invited government’s attention into the matter. Instead of looking into the matter seriously, the Chief Minister and the Cultural Affairs Minister are criticising the Judge,” Adv A Jayasankar added.